Traillblazer Ministries offer to you an online Bible College course. We will cover ten subjects in our Associate Diploma of Biblical Studies. On successful completion you will receive a certificate from us. 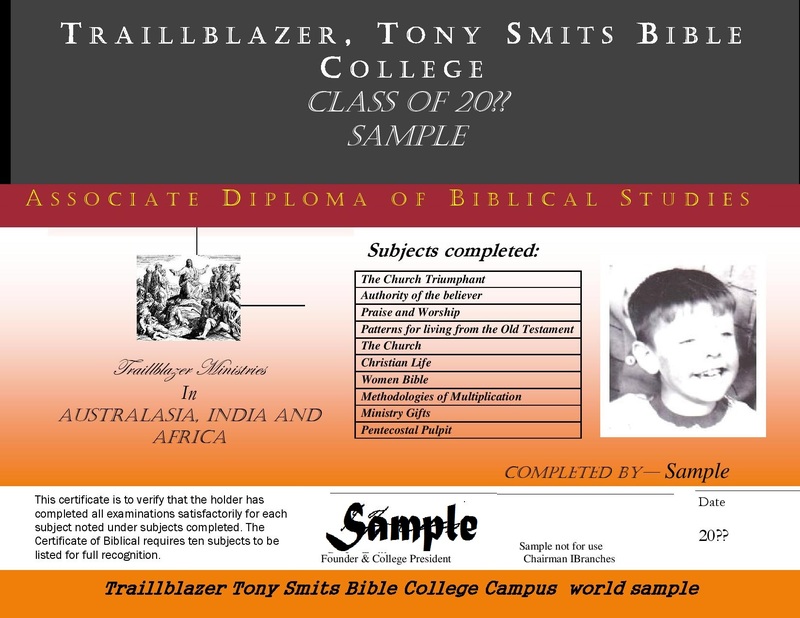 Please note this level at the moment is not recognised or credited by any nation or other Bible colleges. For further studies, we would however encourage you to continue your studies through Vision Bible College whom we have an arrangement with. Subjects on offer are listed below: go to the links in blue find the 10 subjects. Books are only by purchasing them in our bookshop, or online as an ebook. If a student would like the student’s study booklet in WORD Doc we will supply it on request after a student enrolls. The Book for the subject is available to order on this page too. The Book for the subject is available to order on this page too. This book is used for the next two studies too. The Book for the subject is available to order on this page too. This book is used for the next studies too.